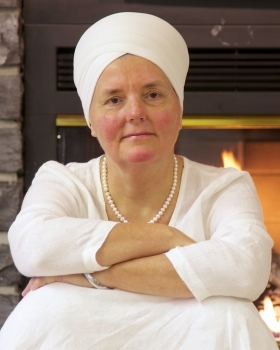 Sat Dharam began studying and practicing Kundalini Yoga with Yogi Bhajan in 1979 and has facilitated teacher training programs over the last 20 years. Sat Dharam teaches a popular and transformative 220-hour Kundalini Yoga Teacher Training Program in Toronto. She has developed and teaches a yoga-based addiction recovery program with Dr. Gabor Mate, and has pioneered a breast health yoga training, designed to help educate women in breast cancer prevention through Kundalini Yoga and lifestyle change. Sat Dharam was awarded the "Naturopathic Doctor of the Year" by the Ontario Association of Naturopathic Doctors in 2000 for her work in breast cancer prevention and environmental education. Sat Dharam's bestselling books include A Call to Women, The Complete Natural Medicine Guide to Breast Cancer, and The Complete Natural Medicine Guide to Women's Health. "Do you ever feel like you want to do something, but can’t make it happen? It feels too big, too hard, or there’s just too much in the way? Try Kundalini yoga to help find the way. A common experience of devoted Kundalini yogis is positive rapid change in one’s life as subconscious beliefs, thoughts and physical holding patterns are dispersed. Be the change you wish to see as you use asanas and mantra to cleanse the subconscious mind, balance the hemispheres of the brain and wake up to your glory. " We create our habits; our habits create us. Commit to redesigning yourself as you utilize Kundalini yoga to reprogram neural networks, cleanse the subconscious, release past conditioning and activate the higher chakras to align with your soul’s purpose. Learn techniques to break addictive tendencies, reroute brain circuits, balance the glandular system and develop the navel chakra. Awaken your courage, intuition, self-compassion, patience, honesty and dedication.